Between the months of March and April staff members at the University of St Andrews were invited to take part in the annual Staff Travel Survey. This year we received an outstanding 929 responses (42%), providing an in depth insight into the behaviours and views of academic and support staff from across the university. In this blog we provide a brief insight into the main findings of the survey. 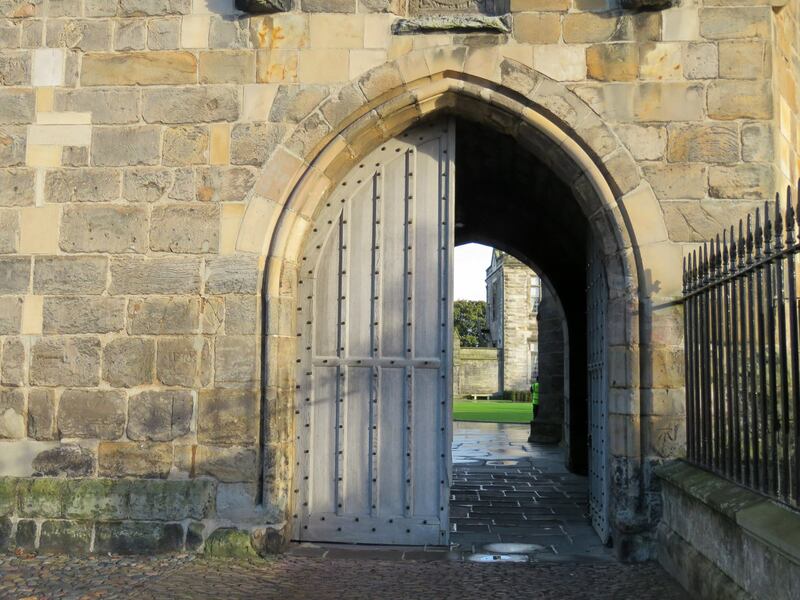 If you would like to know more, or if you would like tell us more about your views on travel in St Andrews, please email environment@st-andrews.ac.uk. For many of our staff members in the university travel makes up a large part of their day both before and after work, and as the global influence of the university extends to all corners of the globe travel for business is becoming extremely important for both academic research, and maintaining international connections. 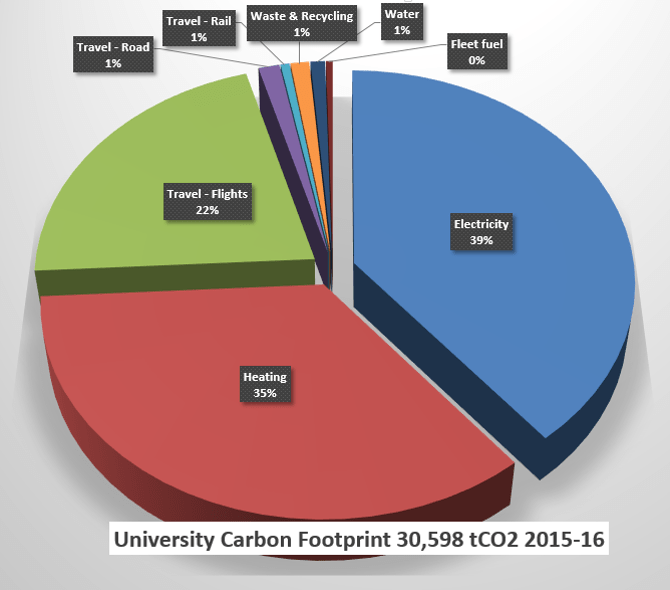 This is accounted for in the university’s carbon footprint which provides an accurate account of the amount of carbon we are using and emitting within a variety of areas. One of these areas includes travel, and more specifically, business travel. The results of carbon footprint for the year 2015 – 2016 can be seen below with business travel making 22% of the total carbon footprint. Every year the university conducts a Staff Travel Survey which is analysed by the Environment Team. This is aimed at helping the university understand the behaviours and attitudes of our staff and the requirements they have at work in order to efficiently plan for the future, in terms of infrastructure and services available. The main results of the 2017 survey are highlighted below. How do our staff travel to work? 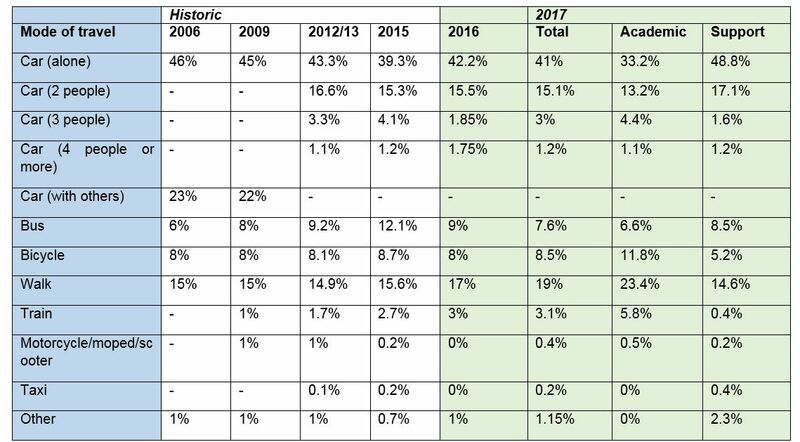 Since 2016 the number of staff travelling by bike to work has increased by 0.5%, and the number of staff walking to work has increased by 2%. Overall statistics are encouraging as we see staff member choosing sustainable transport options, particularly during working hours. Over 60% of staff take the opportunity to enjoy St Andrews and stretch their legs by walking between meetings within town. We view personal feedback as being integral to how we manage future projects and target resources. From the feedback received in the survey 45.6% of academic staff would consider cycling to work on a frequent basis if the cycle paths in town were improved and if the university provided more showering facilities across campus. The second part of the survey focused primarily on the effects of the move to Eden Campus for support staff members. Overall figures indicate that commuting distance and time taken to get to work will increase. From the support staff figures 30% stated that their car usage would increase and 11.7% stated that the move would increase their bike usage. Concerns raised include, the facilities provided at Eden Campus including car parking spaces, connections to town to increase ease of business travel and the effect commutes will have on work hours. Thank you to all who took the time to fill out the survey. We greatly appreciate your time, and your thoughts and insights. A huge congratulations to our survey winners! Lynsey Smith, Education Liaison Office in Admissions, who won a £50 DP&L Travel Management travel voucher, Andrew Clark, Research Assistant at the School of Biology, who won £100 in Amazon vouchers generously donated and presented by Gary Overstone from Hardies Property & Construction Consultants, and Rachel Nordstrom, Photographic Collections Manager, who won the free membership and one day free booking kindly donated by E-Car Club. If you would like to see a more in-depth and detailed analysis of the results please email environment@st-andrews.ac.uk.